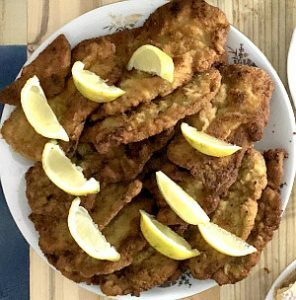 Since the Wiener Schnitzel (or Wienerschnitzel) remains at the epicentre of Viennese cuisine, read its story and best Schnitzel recipes. Essentially, Wienerschnitzel is a thinly hammered and breaded veal or pork cutlet. 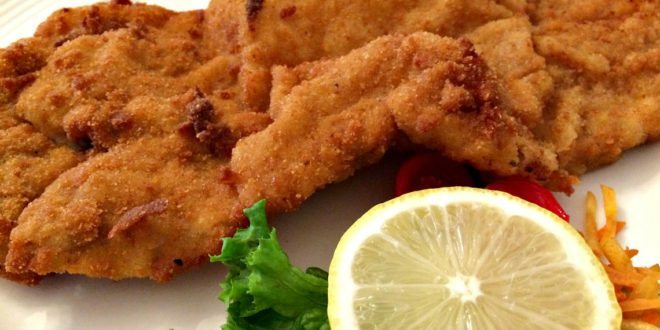 While chicken schnitzel are good, too, the best Wiener Schnitzel are made from tenderloin pork or leg of veal. Not only must they be four to six millimeters thin, they also need to be crispy and well drained from fat. From a culinary point of view, Schnitzel stands for our love for all things breaded and fried: from meat to fish, mushrooms, celeriac, cauliflower, and even cheese. 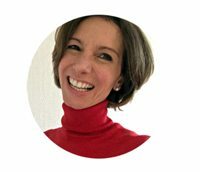 You can obviously enjoy them in all restaurants in Vienna that serve Austrian food. Like all legendary dishes, the Wienerschnitzel’s history has been controversial. Some say it is a cultural import from the Italian Costoletta a la milanese in the 19th century. Although many historians say this is a myth. Ultimately, the most convincing theories state that the Schnitzel is a bourgeois invention of 18th century Vienna. At that time, the upper class Austrians already breaded their chickens, dressing up the fact of devouring dead animals. For sure they had plenty of pork fat to fry, and loads of breadcrumbs from the vast amounts of white bread consumed. If you are a history buff you can find the earliest reference to breaded cutlets in the ‘Kleines Österreichisches Kochbuch’ from 1798, called Gebachene Schnitzeln. When he had clean hands my son shot the following photos during our Vienna cooking class – highly recommended when you visit Vienna! Put a few drops of vegetable oil on the cutlets. Then put them in between two sheets of cling film and flatten the cutlets with a meat tenderizer. If you don’t have one, you can use a heavy pan instead. Make a few short cuts into the outer areas of the cutlets to prevent them from rolling up in the pan. Prepare three plates, one with flour, one with two eggs lightly battered with a little milk and a pinch of salt, and one with bread crumbs. Instead of the eggs, some people use water or milk, though I have no experience with this. Lightly coat the cutlets in flour on both sides, then pull them through the eggs (water/milk), and cover them with breadcrumbs. Make sure the breadcrumbs cover the entire cutlets. 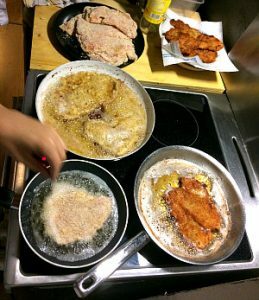 Start frying the cutlets immediately in a pan with pork fat (original method) or vegetable oil. Add sufficient fat or oil to make the cutlets swim, and heat it. To get the right temperature, add a few breadcrumbs into the pan. If the oil foams, the temperature is right. Keep moving the cutlets to generate an even goldbrown colour. Turn them at least once until they are golden brown on both sides. Put the Schnitzel on a sheet of paper kitchen towel which will absorb the oil. Wiener Schnitzel are usually served with a wedge of lemon on top, and with warm or cold potato salad, and lettuce. Here are the most popular varieties in Vienna and Eastern Austria. 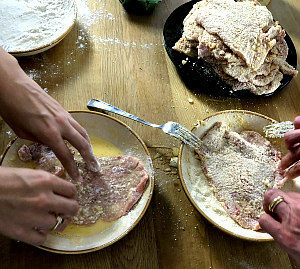 A popular Austrian variety, the Surschnitzel uses salt pork cutlets in brine instead of normal pork or veal for the Wiener Schnitzel. 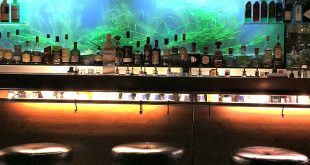 You can try them at many Lower Austrian and Vienna wineries and taverns. Some Viennese taverns and restaurants serve rolled Schnitzel. These are usually rolled pork cutlets, filled with spinach and cheese. 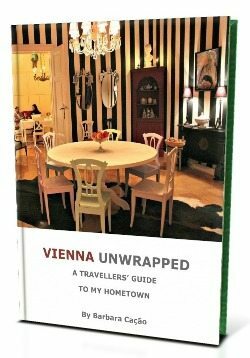 I remember the best Schnitzel roulade I had at Villa Aurora in Vienna. Though likely of Swiss origin, the Cordon Bleu is hugely popular of Eastern Austria, especially of Vienna. It is prepared like a Wiener Schnitzel, but has a layer of ham and cheese on one side underneath the breadcrumbs.